Pro Nautical Duffel for a limited time in Color Fusion Film! The Pro Nautical is the BEST DUFFEL IN THE WORLD for beaches and boats. Don’t be fooled by its light weight; this duffel’s material is ballistic-grade and water-resistant. Jam a wet wetsuit or harness into the bag, and the water will drain from the grommet vents. There’s no worry about anything wet as the bag laughs in the face of water damage. And if you spill something particularly nasty inside, don’t worry; throw Pro Nautical (inside out) in the washing machine and it will be back to perfect. And of course, it’s Ezzy strong. David Ezzy worked with Dimension Polyant to develop Color Fusion Film. The key is mixing color into the adhesive before lamination so the color does not compromise performance at all. Due to the random nature of the injection process, no two meters of cloth look the same. This means that every sail is unique. 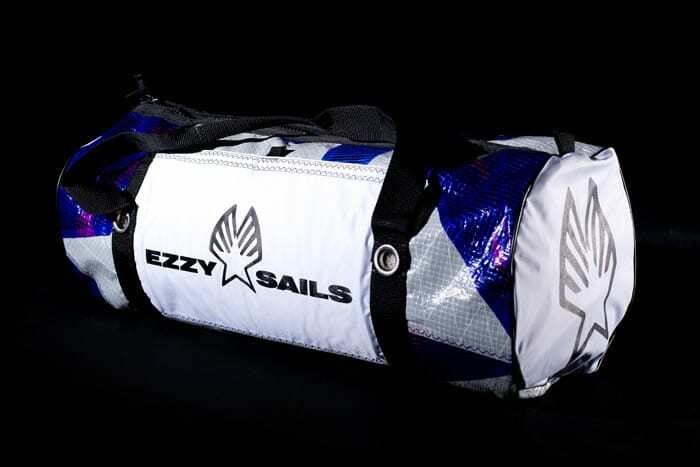 And therefore, each duffel, which is made from recycled sailcloth, is uniquely colored too.